Know someone that as a special day coming up? Want to say "Thank You" in a special way. 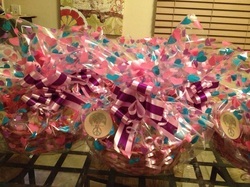 Whether it is for one basket, or for 20, I would love to make you a gift basket, and will make you something beautiful. It full of my great handmade, organic soaps, lotion bars, & scrubs & more! Use the contact form below, and I will get back with you in regards to what you would like. Please keep in mind, that the shipping will be higher on the baskets than that of my regular soaps. Please include your phone number, should I need to contact you.